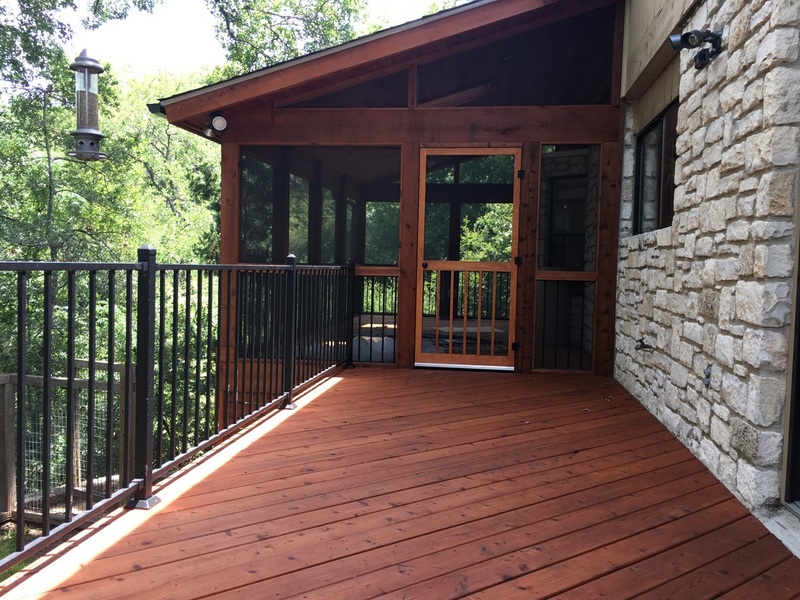 Archadeck of Austin to the rescue, 911, for this Screened Porch Project in NW Austin! If you’ve heard of fly-by-night contractors who start a job, take your money and skip town, we are not those guys. But “those guys” started a job at this home in NW Austin and left without finishing it. Archadeck of Austin, deck and porch builder, came to their rescue! — Archadeck of Austin to the rescue! Besides losing their money in Round 1 of this project, the homeowners also lost access to their back yard! Can you imagine? The original contractors tore the old deck off of the home, removing access to the yard below. Unbelievable. That’s where Archadeck of Austin came in. The project was to build a screened porch with a shed roof, skylights and a small deck. It turned out the original contractors had not obtained the necessary permits, so we picked up the job at that point. They were also supposed to consult with a structural engineer on a specific aspect of the project and had not followed up. The homeowners had the layout for the project complete. We made a few changes to enhance their design, but for the most part, we were able to work with their original vision. And what a beautiful project it turned out to be! We built the screened porch and deck with cedar, and the porch ceiling is tongue and groove cedar and we installed sky lights, too. The addition to this beautiful tree covered rear makes porch feel like a screened in tree house! The roof type is a shed roof. 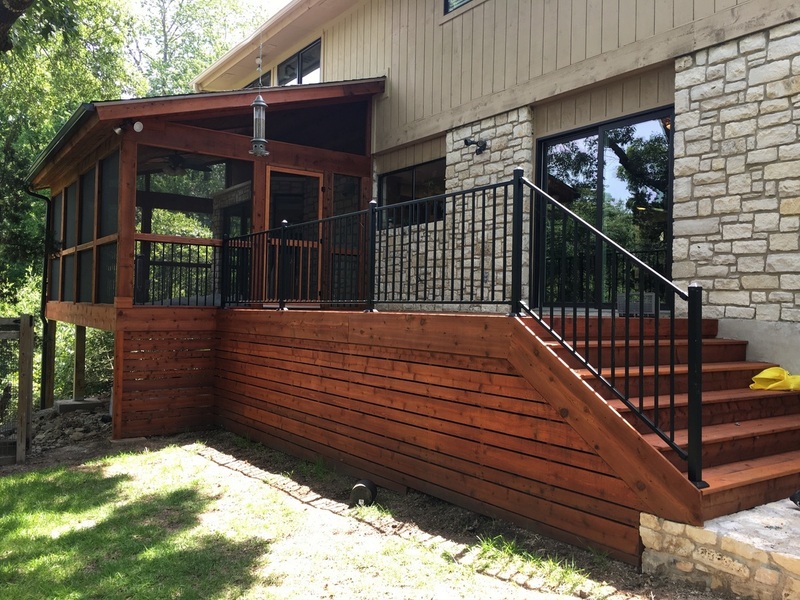 The homeowners chose to surround the lower screened area of the porch with a railing and balusters instead of using a knee wall. They chose an attractive black railing system by Fortress. Black is the color you want for making balusters “disappear” when you look through them. The engineering challenge was in response to a 10-foot drop-off at the back of the clients’ lot—actually right off the back of their house— with a creek below. One of the footings had to be very carefully installed with this drop-off in mind. 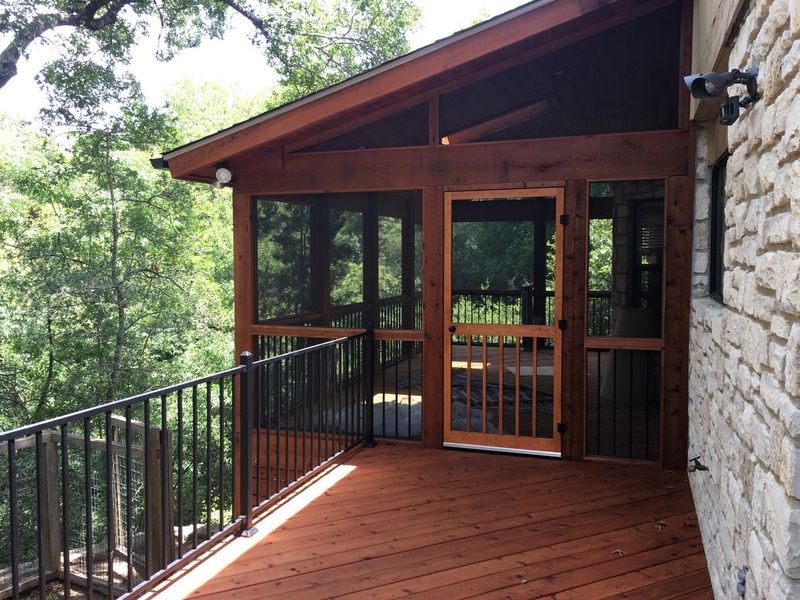 In addition to completing the screened porch project, Archadeck of Austin also installed siding and new windows above the screened porch. These items were not included in the original contract but were added by the clients. We also did some stone work for them, and we designed and installed a trash can receptacle. These NW Austin homeowners are both engineers, so they are meticulous and very knowledgeable. 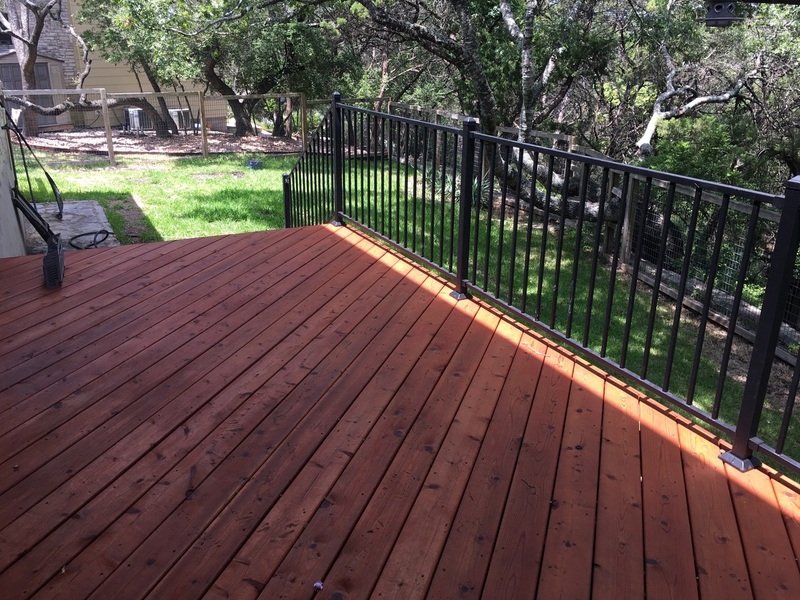 They love the completed project and are exceedingly happy that they hired Archadeck of Austin to complete the job. Their only regret is that they didn’t start with Archadeck in the first place. We hope you never have to call us in to straighten out a mess left by another contractor, but if you do, we’re here for you! 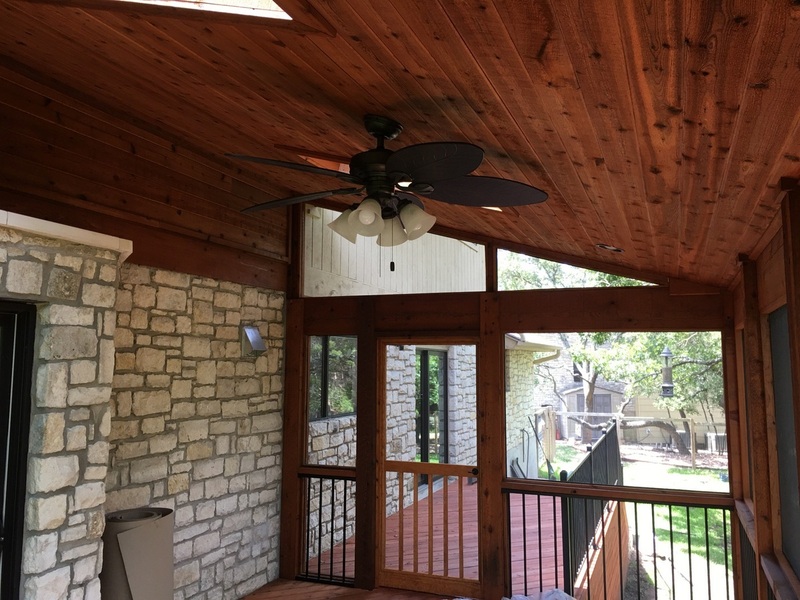 To have your screened porch or deck designed and built correctly the first time around, call Archadeck of Austin today at (512) 259 – 8282 or via email us to schedule a free design consultation.